English: "131028-O-ZZ999-103 BATH, Maine (Oct. 28, 2013) The Zumwalt-class guided-missile destroyer DDG 1000 is floated out of dry dock at the General Dynamics Bath Iron Works shipyard. 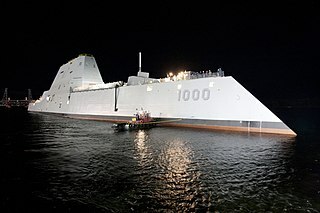 The ship, the first of three Zumwalt-class destroyers, will provide independent forward presence and deterrence, support special operations forces and operate as part of joint and combined expeditionary forces. The lead ship and class are named in honor of former Chief of Naval Operations Adm. Elmo R. "Bud" Zumwalt Jr., who served as chief of naval operations from 1970-1974. (U.S. Navy photo courtesy of General Dynamics/Released)"